For residents of the small towns neighboring Houston, watching a movie meant either driving into the city, or attending their local theatre. Many of the smaller towns had a movie house nearby, often located in the downtown district. This was the case with the first theatres constructed in Alvin. Its first movie house, the Star Theatre, operated during the teens, as did the U.D.C. Hall. In 1919, the Grand Theatre was opened, then changed hands on several occasions, finally coming under the control of the man who was to have a major impact on the theatre industry in the region  Johnny G. Long. J.G. Longs purchase of the Grand was the beginning of a theatre chain that encompassed such points as Bay City, Port Lavaca, El Campo, and Beaumont. The Long Theatre Company was an independent chain and booked second-run films, usually after their initial showings in the Houston movie palaces. The Grand continued operations for the next fifteen years. 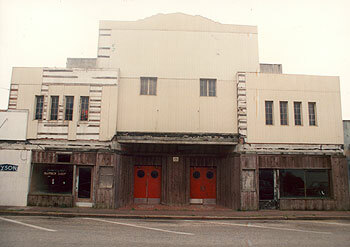 The Alvin Theatre in 1987. On February 23, 1936, the new Alvin Theatre opened its doors to the public, quickly filling the auditorium to capacity and spilling out to the lobby. For Alvinites, Longs Theatre was a center of activity, back in much simpler times. People would go downtown on Friday and Saturday nights for a movie, or just sit in their cars and watch the crowds go by. That was Saturday night entertainment. Aside from a steady stream of motion pictures, live appearances were also a common occurrence, with such luminaries as Tex Ritter and his Musical Tornadoes, Ramblin Tommy Scott, and Luke McLuke. By the sixties, the Alvin Theatre was a pale ghost of the past. The theatre closed down in the sixties, and excepting its brief stint as a revival house, sat dormant, neglected, and forgotten. It was razed in 1996, as part of a downtown vitalization program. 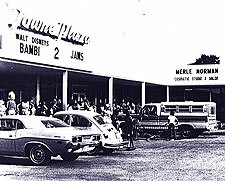 The Towne Plaza Theatre in 1974. In May, 1968, the owners of the Towne Plaza Shopping area announced their plans for expansion of the outdoor strip center. The prime focus of the $250,000 construction was a new cinema, filling the void that the old Alvin theatre left. The new Towne Plaza Theatre opened on Thursday, February 27, 1969, with its premiere feature: The Beatles in Yellow Submarine. The single-screen theatre was eventually twinned. 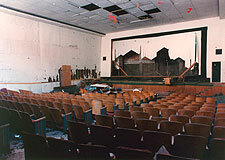 Later, adjoining space was converted into additional auditoriums. The space underwent a renovation in 2013, the main auditorium restored to its original size, and reopened as the Welborne Cinema. The first Alvin drive-in was located at the corner of South Gordon and South street. The tower remained intect for years after the theatre closed. In the seventies, the Cinema Park Drive-in was opened, located outside Highway 35 on Highway 6.